When you are dealing with children with cognitive difficulties (a.k.a. learning disabilities, special needs, intellectual disabilities, ADD, learning differences), one thing to remember is that when the child is having to work hard in one area on a task, decrease the level of difficulty on accompanying tasks. In other words, if your child is having to concentrate hard on learning the process of multiplication, don’t tax his ability to recall multiplication facts. Remember these? This is a Magic Math Multiplication press and reveal board. You press on the button with the multiplication fact printed on it, and as it depresses, it reveals the answer. No plugs, no batteries. It sells for ridiculously big bucks on Amazon – Ebay is much more reasonable. I happened to pick up ours at the thrift store. 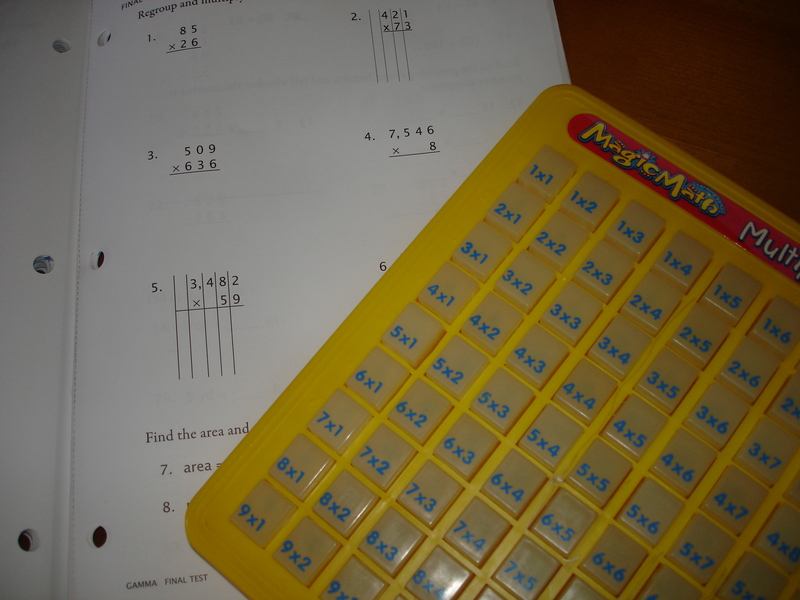 I admit, this Magic Math Multiplication press and reveal board had gotten pretty dusty sitting in the back of our homeschool cabinet. By itself, it does not offer much in the way of motivation to a child learning his multiplication tables. But after pulling out hair after hair working with Andres last week, I had a flash of inspiration. I handed this to him at the beginning of a session of working long multiplication problems and told him to use it when multiplying digits. All he had to do was stay focused on the sequence of steps, and he could let the board do the figuring. BINGO!!!! Freeing up all his mental energy and working memory by giving him a tool that just required him to push a button for multiplication facts was exactly what he needed. Hmmm. “Aren’t you just giving him a crutch?” you ask. Well, sort of. Except I know kids. And I know that kids gravitate towards the quickest way to do a job. So I know just as soon as Andres gets to a point developmentally where he can handle recalling his multiplication facts while he is following the process of long multiplication, he will ditch the press and reveal board quicker than you can say “What’s 7 times 4?” In the meantime, Andres works on long multiplication in the morning with his board and works on drills and flash cards without his board in the afternoon. This is just one of the many ways you can support a child with learning difficulties so that he can continue to progress rather than allowing him to stay stuck when a challenge presents itself. What are some more ways that have worked in your classroom or home school? So, I stuck my head out the door to make sure Noah hadn’t gone AWOL, and I see Andres over at the spigot. (Door shuts, mom ducks back inside. Two minutes later (sometimes my brain goes into the buffering mode when it comes to auditory stimulus). If you haven’t entered my SnapWordsA app (sight words taught through characterized flashcards and games) giveaway, today is your last chance – go here to enter by leaving a comment: https://wordsofhisheart.wordpress.com/2013/02/04/snapwordsa-app-for-iphone-and-ipad-by-child-1st-review-and-giveaway/. Winners will be announced Friday, February 8, 2013. Well, here we are not even three months out from Andres’ Chiari 1 malformation decompression surgery. “How are his headaches?” you ask. The neurosurgeon shook his head and reminded us the week before surgery that because Andres didn’t have the typical Chiari back-of-the-head headaches, there was only a 30% chance they would go away after surgery. Andres is running, jumping, playing, riding his bike, getting out of breath, and not needing to come inside and lie down. The little boy with the grimmace is gone. It’s amazing what a few months (and a great surgeon) can do.